"Between East and West, between Earth and Sky, lies the Endless Waste. Barren and desolate, this windswept land forms the barrier between the feuding kingdoms of Faerun and the ancient empires of Kara-Tur. The eternal steppe is home only to the hardy, nomadic horsemen who travel its secret paths. • A clear plastic measuring overlay." But when invaders threaten the Hidden Kingdom, the player characters are given a chance to earn their liberty. They are charged with escorting a spoiled princess and her dowry, a ferocious black stallion, to a nearby kingdom as a bribe to stop a war. Nothing stand in their way except 40,000 bloodthirsty riders and a vengeful purple dragon. 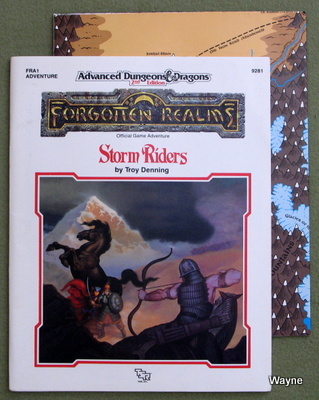 Storm Riders is the first adventure in the Empires Adventures Trilogy, and the first adventure taking place in the new FORGOTTEN REALMS campaign world territories described in The Horde campaign set. The Empires Adventures Trilogy is also set amidst the turbulent events portrayed in the Empires Novel Trilogy. This adventure is designed for four to eight player characters of levels 5-7." "Terror stalks the Realms! 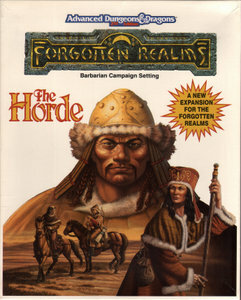 In a world where the unexpected is the only predictable thing, no one could have foreseen The Horde... from the utter east, an unstoppable legion of dark riders thunders from the lost horizon, and bitter enemies must band together in a desperate struggle for survival. A few, scattered heroes dare to delve into the east, seeking a way to stop the invasion at its source. Your PCs will adventure across unknown wilds, into a mystic kingdom that lies far beyond the impassable Katakoro Mountains. Winter trolls, wu jen, nagas, vampires, and worse await them. Will they survive? Only if the act in perfect unison, and use their cunning and teamwork to avoid bringing disaster down upon themselves from every direction! A great adventure." ...from Amazon reviewer "darkseraphim"
"The Purple Dragon is caged! But Ra-Khati isn't out of danger. The evil Raja Ambuchar Devayam is holding the Dalai Lama to his promise. If the player-characters don't deliver Princess Bhrokiti and the Black Courser to him - and even if they do - the Raja's foul army will once again march on the Hidden Kingdom. What is it that Devayam really wants with Ra-Khati? Only your player-characters can discover the awful truth. When they do, their journey will take them to the farthest reaches of Shou Lung. Providing they can escape the diabolic assassin sent to stop them, they will find the lost city of Kuo Meilan. There, they must penetrate to the lost city's wicked heart and find the Stone Scepter of Shih. Only armed with this artifact, and the secret connecting it to Ambuchar Davayam, can they hope to save Ra-Khati -- or themselves. 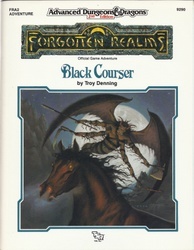 The Black Courser is the second adventure in the Empires Aventures Trilogy, taking place in the new FORGOTTEN REALMS campaign world territories described in The Horde campaign set. The Empires Adventures Trilogy is also set amidst the turbulent events portrayed in the Empires Novel Trilogy. This adventure is desgined for four to eight player characters of levels 6-9, and can be played as a seperate, stand-alone module or as a follow-up to FRA1, Storm Riders." "The Stone Scepter has been recovered! But will it be enough to stop the Raja of Solon? Ambuchar Devayam has massed 10,000 zombies on Ra-Khati's border. Only Gaumahavi, the Great Dragon of the Purple Wastes, stand between him and the Hidden Kingdom. Yet even she cannot face Ambuchar alone, for the evil raja has recovered an archaic Imaskari relic that render him invincible. If Ra-Khati is to be saved and the player characters are to escape the raja's curse, Ambuchar Devayama must be stopped. But how? The player characters' search for a solution will embroil them in Tuigan politics, lure them to the Red Mountain Monastery's forbidden halls, and lead them into ancient Solon itself, where Ambuchar's slaves - both living and undead -- toil to make him even more dangerous. 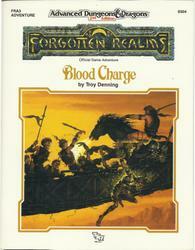 Blood Charge is the third adventure in the in the Empires Aventures Trilogy, taking place in the new FORGOTTEN REALMS campaign world territories described in The Horde campaign set. The Empires Adventures Trilogy is also set amidst the turbulent events portrayed in the Empires Novel Trilogy. This adventure is desgined for four to eight player characters of levels 7-10. It can be played as a seperate, stand-alone module or as the sequel to FRA2, Black Courser." The streets of Manass remained empty as the priest and his barbarian bodyguards marched through the town. The procession saw few men until it rounded a corner and entered a large plaza. There, armored soldiers carrying wicked-looking swords formed a wall. The priest bowed to the governor, who stood foremost in the ranks. "I am Koja of Khazari," he began, a little nervous. "I bear you greetings from Hoekun Yamun, khahan of the Tuigan, who styles himself Illustrious Emperor of All Peoples. He has sent me to deliver a message. The words of the khahan are these: 'Submit to me and recognize my authority over your people or I shall raze your city and destroy all those who refuse me.'" As Koja finished the demands, there was a murmur of shock and surprise from the soldiers in the plaza. Many eyes turned to the governor, whose face was purple with rage. "Is that all your barbarian friend has to say?" he shouted. The priest wiped his sweaty palms on his robe. "No, Lord Commander. He also bids you to look over your walls from your highest tower." "I've seen the reports from the sentries. Your khahan has gathered himself a sizable force of bandits. And now he wants to style himself 'Illustrious Emperor of All Peoples?' He's got a lot to do before he can claim that title," the governor said with a sneer. "Does he really think he can capture Manass with that puny force?" Koja smiled slightly. "Yes, Lord Commander, he does."